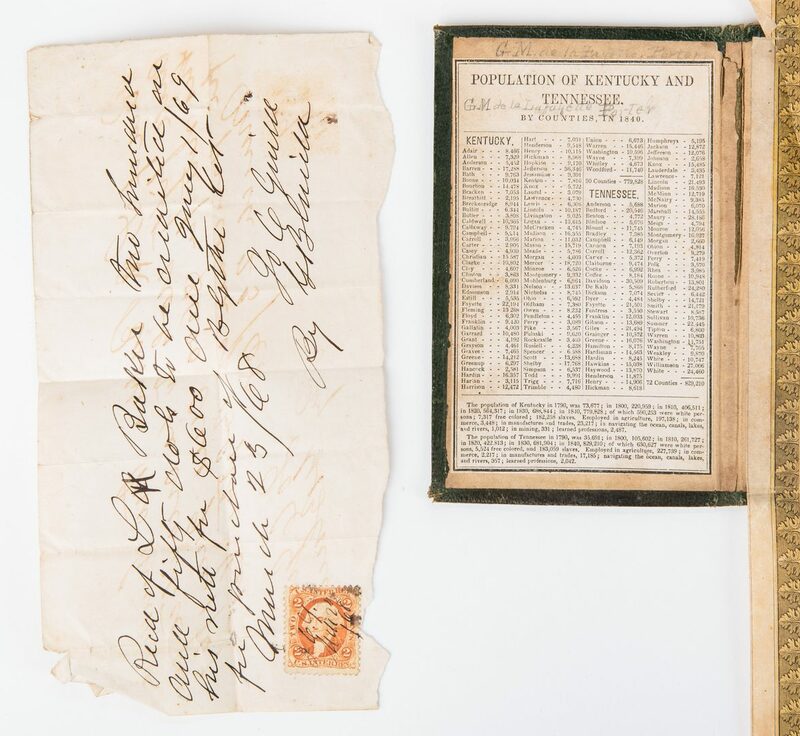 Kentucky and Tennessee Map, Civil War letter, and receipt, 3 items total. 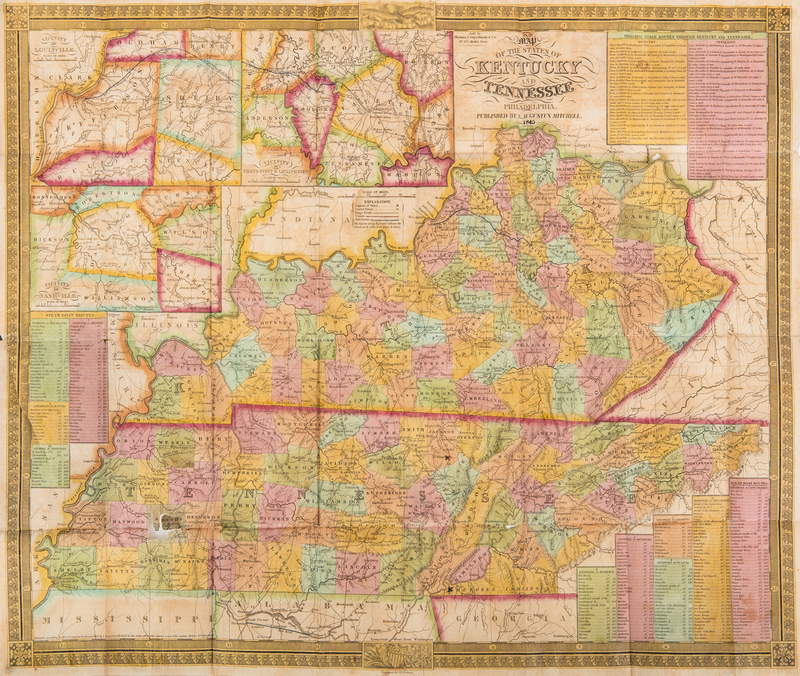 1st item: "Map of the States of Kentucky and Tennessee," engraved by J. H. Young, published by Samuel A. Mitchell, Philadelphia, 1845. From the "Tourist Pocket Map" series by Samuel A. Mitchell. 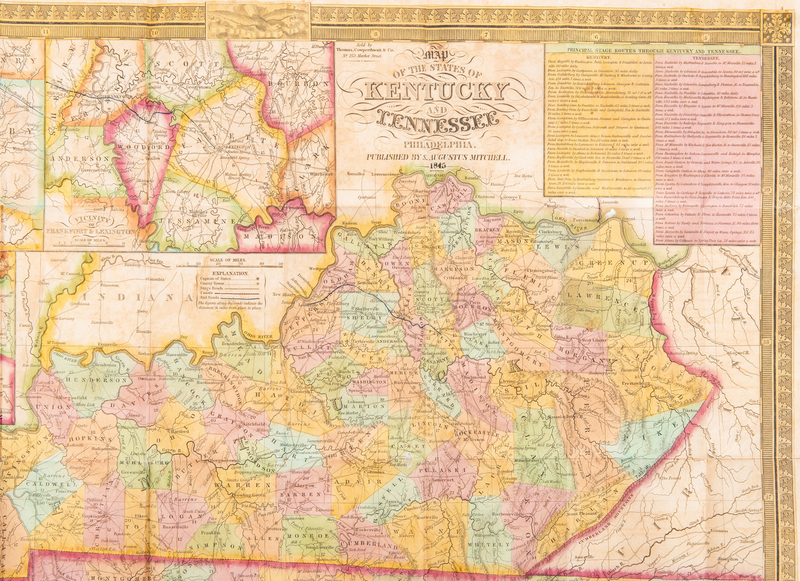 Copper plate engraving with hand coloring of Kentucky and Tennessee depicting towns and roads, county lines, names of counties, rivers, mountains, and railroads. Inset maps of "Vicinity of Nashville", "Vicinity of Louisville", and "Vicinity of Frankfort & Lexington", top left. Title and scale of miles, top right, Principal Stage Routes tables, top right, tables of Steam Boat routes and distances, lower right and center left. 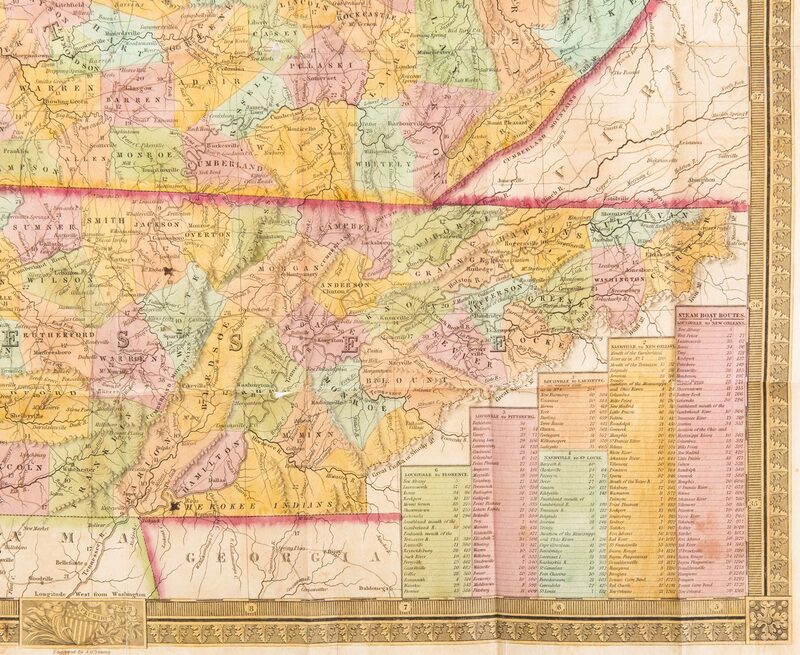 "Longitude West from Washington", centered below map. 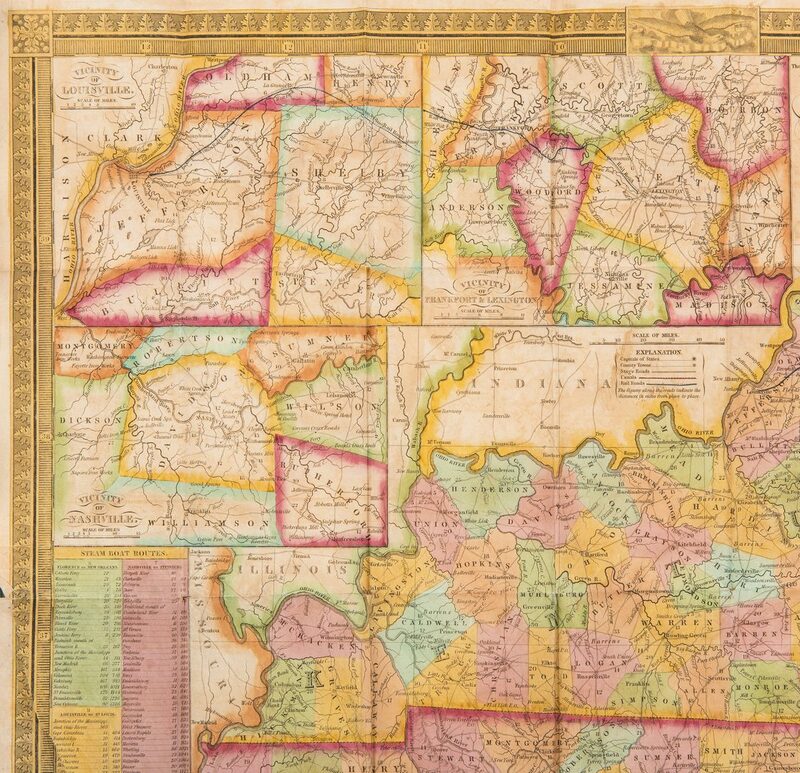 Map surrounded by scale notations and decorative acanthus leaf border with patriotic vignettes. 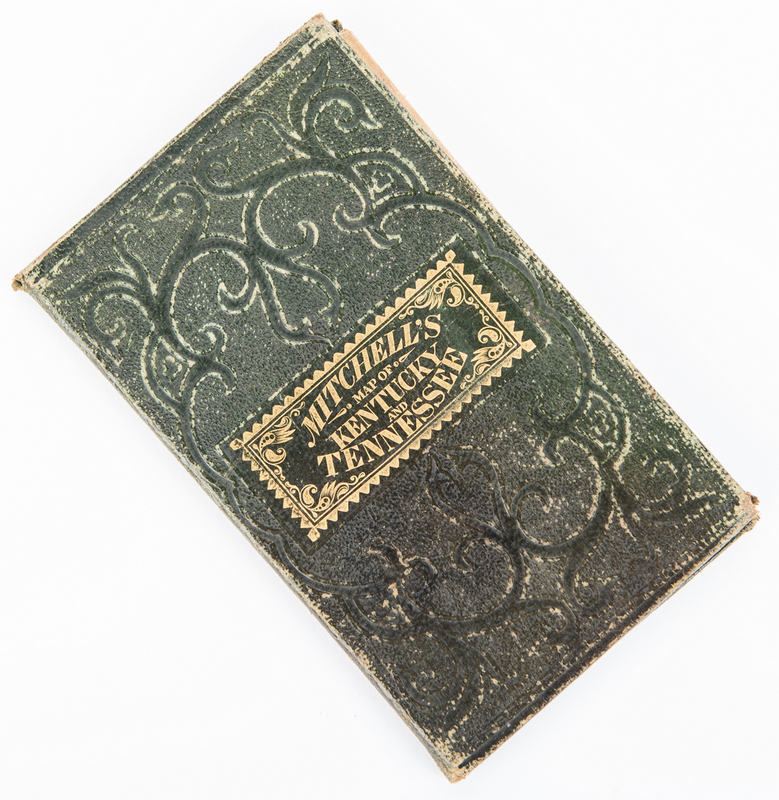 16mo when folded, housed in original tooled green leather covers, stamped with gilt title lettering, front cover. "Population of Kentucky and Tennessee By Counties, In 1840" table with two (2) pencil inscriptions reading "G. M. Lafayette Porter, inside of front cover. 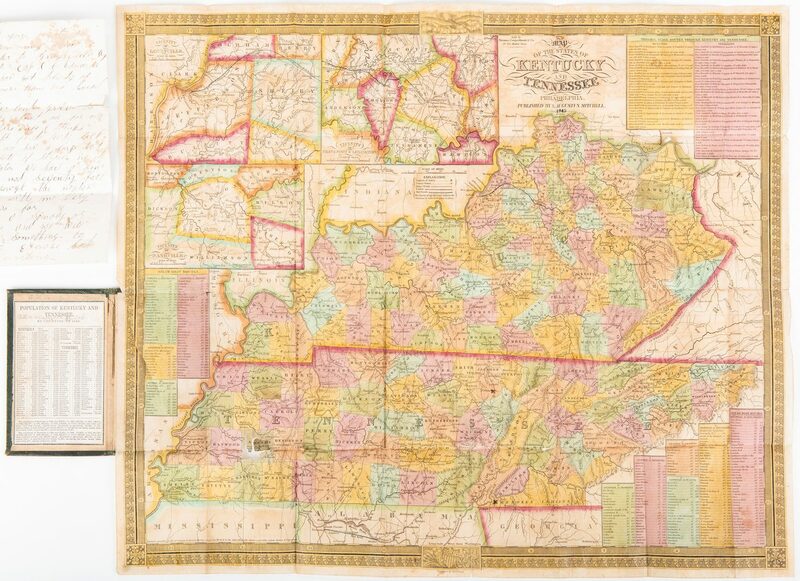 Map – 18 1/4" H x 21 3/4" W. Folded – 5 1/2" H x 3 3/8" W x 5/8" D. 2nd item: ALS. Two-page, double-sided handwritten bifolium. 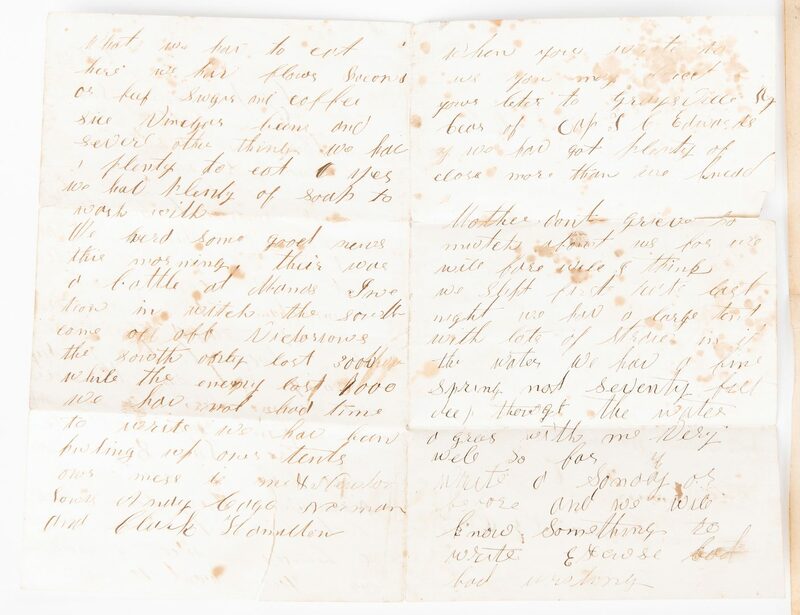 From Private E. C. Goheen, 3rd Regiment, Kentucky Mounted Infantry, Company G, to Bettie Goheen, his mother, dated July 23, 1861. He writes "We are here safe & sound in as good health as we was when we started and are very well satisfied We come from Birmingham to Sanville by Swn rode [sic] stayed there until two o'clock [on] Monday morning…The Boys that was here is all well Norman has been sick but has got well [almost]…What we hav[e] to eat here we hav[e] flour Bacon…beef Sugars and coffee…Vinegars beans and sever[a]l other thing[s] we have a plenty to wash & yes we have plenty of soap to wash with…We herd [sic] some good news this morning their [sic] was a battle at Manas [sic] [The First Battle of Bull Run, also known as the First Battle of Manassas, fought on July 21, 1861]…in witch [sic] the south come off Victorious the south only lost 3000 while the enemy lost 7000…When you write to us you may direct your leter [sic] to Graysville Ky [care] of Cap F C Edwards…". 8" H x 5 1/8" W. Note: 3rd Infantry Regiment was organized during July 1861, at Camp Boone, Tennessee. Many of the men had previous service in the Kentucky State Guard. The unit took an active part in the Battle of Shiloh and reported 174 casualties. Later it was assigned to Rust's and Buford's Brigade, Department of Mississippi and East Louisiana. It lost 26 men at Baton Rouge then participated in various conflicts around Vicksburg and Jackson . 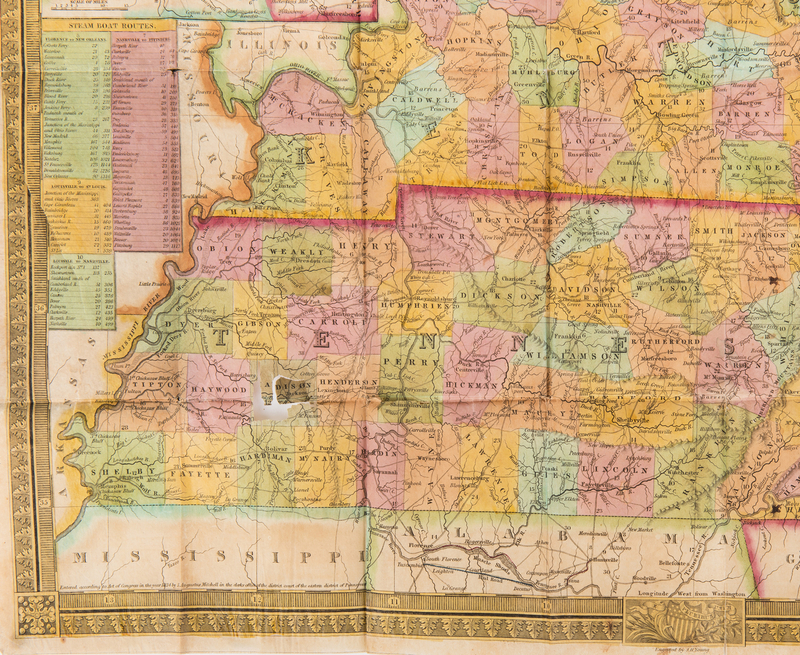 During the spring of 1864 the regiment was mounted and continued the fight by confronting the Federals in Mississippi, Georgia, and Alabama. It was included in the surrender on May 4, 1865. The field officers were Colonels Gustavus A.C. Holt, Albert P. Thompson, and Lloyd Tilghman; Lieutenant Colonels Benjamin Anderson, T.T. Barnett, and Alfred Johnston; and Majors James H. Bowman, William P. Johnston, and Al. McGoodwin. (source: http://www.kykinfolk.com/adair/confederate.htm). 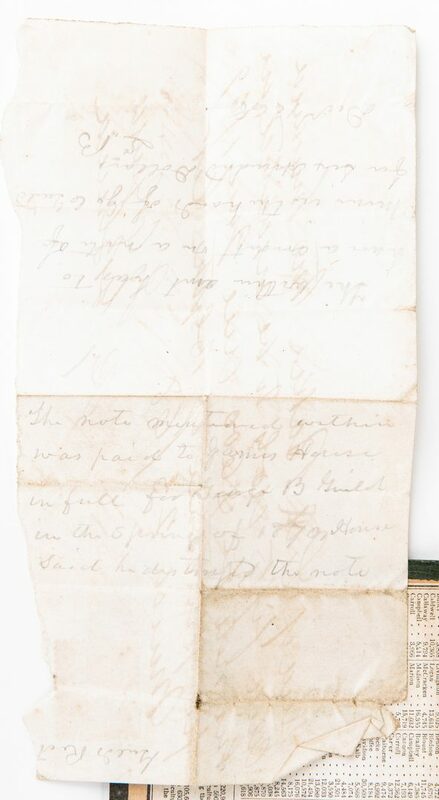 3rd item: Receipt indicating that G C. Guille by G Bluida has received from L. Barker "two hundred and fifty dollar to be credited on his note for $6000 due July 1, 69 for purchase of Blythe Cet March 23, 68" with orange two cent George Washington stamp, lower left. Pencil notations, en verso. 4 1/4" H x 7 5/8" W. Provenance: Collection of internationally known ragtime pianist and music historian Johnny Maddox, Gallatin, TN. 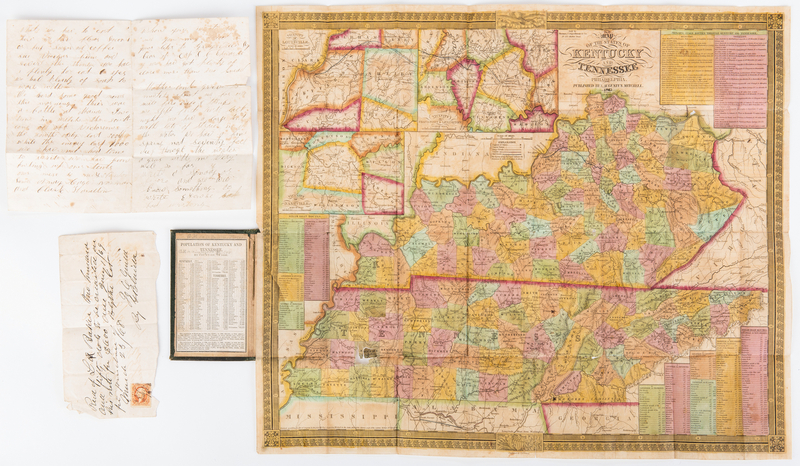 CONDITION: 1st item: Overall good condition with tears, largest 4 1/2", toning, light surface stains, largest 1" x 1/4", surface of map. 5/8" x 5/8" area of Madison county separated from map is included. Covers in overall good condition with wear, corners bumped. 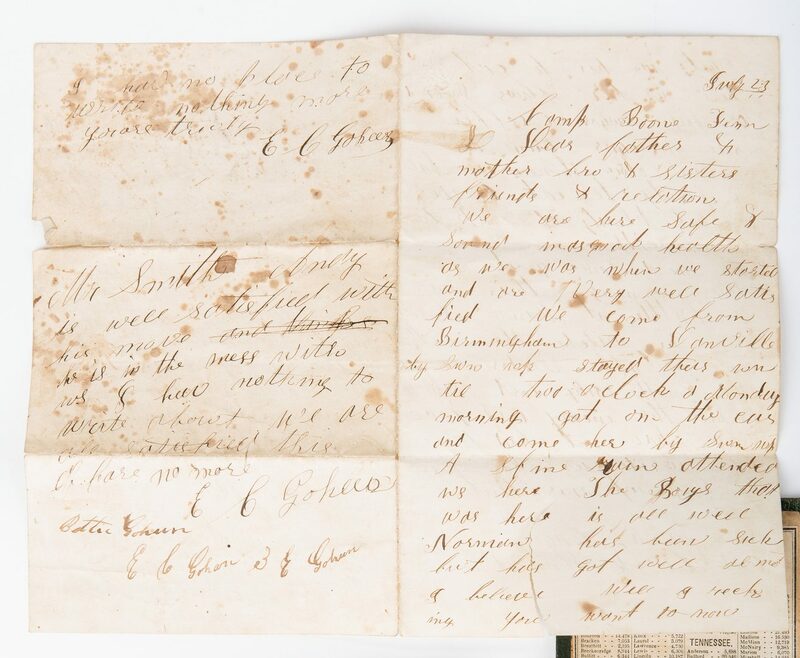 2nd item: Overall good condition with tears, largest 2 1/4", foxing spots, surface of letter. 3rd item: Overall good condition with toning impression, tears, largest 1/4", to receipt.